I have been to Witch’s Rock Surf Camp six times now, but my first time was different from all the others. I had joined a friend’s surf trip. Every time since that first time, several friends or family members wanted to join in the fun. 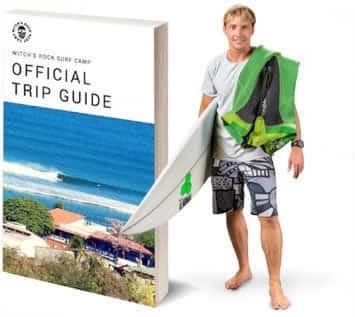 I learned to surf in Tahiti, when my mother won an online sweepstakes for Quiksilver Surf Company. 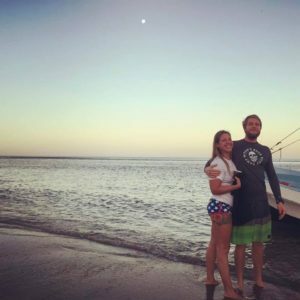 The free trip to Tahiti included surfing with Raimana Van Bastolaer. I had never surfed but quickly fell in love with it on my first ride. When I returned to New York, I immediately bought a surfboard and booked lessons that summer. Everything in New York is hard, fast, and unforgiving… including the waves! I struggled during our very short surf season, and never quite grasped it. Frustrated, I reached out to a friend who had surfed for a few years. She had a trip planned to Witch’s Rock. She had booked a spot in the intermediate group, and I was going to take beginner lessons, starting from scratch. Since my friend left daily at dawn, and didn’t return until dinner, I thought I would be alone all the time, but I was wrong. Witch’s Rock provides such a communal environment, I was never alone! I quickly made friends with everyone else in the beginner group, and they always invited me to sit and eat with them, have a drink, or just hang out share stories about our killer waves of the day, and our epic wipe outs. In my downtime, I befriended the instructors and staff. 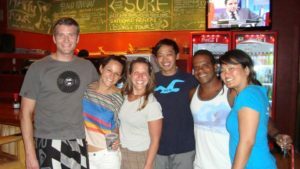 Sometimes, I would sit at the bar at Eat at Joe’s, watching the surf videos and bloopers, and chatting with the bartenders who were determined to teach me how to order in Spanish. Other times, I would sit and watch the ocean with Maxi at the board cage, and my new friends, instructors Andre and J Luis, who had been so patient with me during each lesson. They encouraged me to keep trying, and taught me about the ocean, the tides, the currents, and swells. There was always something to do and someone to hang out with at WRSC. We travelled in groups to different restaurants in town for Taco Tuesday and Reggae Thursday. Some of the instructors even accompanied us to Salsa night at the Monkey Bar. We all congregated daily to watch the sunset, play volleyball, and relax by the pool together. It was like summer camp for grown ups! I have kept in touch with almost everyone I have ever met at camp and have planned return trips with some of them. A few have visited me at home in New York, even one of the instructors, Pako! And when word got out that he was in town, so many people wanted to come and see him, and spend time with him, which led to more life-long friendships. All thanks to Witch’s Rock Surf Camp!